Join us as we discover God’s Love for the nations at this year’s Summer VBS! 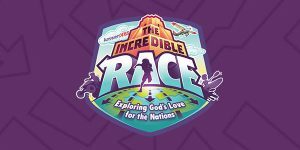 At The Incredible Race, kids will explore God’s love for the nations as they travel around the world. Grab your gear and prepare to set off on the race of a lifetime! Kids will discover that God loves people from every nation. The Bible is God’s revelation of truth to mankind. We know who God is, what He has done, what He is doing, and what He will do from the scriptures. In the Bible, we find how He has reconciled Himself to sinful man. There is one true God who has revealed Himself as Father, Son and Holy Spirit. He is holy and not like man. He is absolutely glorious, perfectly righteous, and unquestionably just. God has revealed to man His demands for how we are to live in this world. Sin is when we miss the mark. We fail to fully obey those commands whether by commission or omission. Sin is rebellion against God. By nature we are sinful and our actions reveal we are sinners. We are enemies of God and are objects of His wrath because we have violated His commands. Religion, church attendance, good works, charity. Man’s attempts to reconcile himself to God will all fall short. But God sent His Son, who lived perfectly on the earth. He gave His life as a ransom for His people. He bore our sins and died for our sins, according to the scriptures (1 Corinthians 15:3). He rose from the grave for our justification (Romans 4:25). We are commanded to repent of our sin and trust on the person and work of Jesus Christ alone to be reconciled with the holy God of the universe. Today is the day of salvation so turn from your sins and trust on Jesus! What does it mean to live the Christian life? We are to work out our salvation with fear and trembling; for it is God who is at work in us, bot to will and to work for His good pleasure (Philippians 4:12-13). We are being sanctified, as the Holy Spirit works in us so we know our Lord more intimately, love Him more passionately, and obey Him more faithfully. We study the Bible and we talk with our God in prayer as the Holy Spirit works in us to conform us into the image of Jesus Christ. But we cannot do this alone, so we invest in a local body of believers, to be made more mature disciples and to help make others more mature disciples. We want to personally thank you for giving online to LightHouse Fellowship. Your donations are helping us build a life giving Church to reach people for Jesus Christ. We take all the resources we receive very seriously and believe LightHouse should be the model of Godly stewardship. Our main desire is to give God glory as we eternally impact the Kingdom of God and this can not be done without you! THANK YOU FOR WORSHIPING GOD WITH YOUR GIVING!